The Mos Eisley Cantina scenes are my absolute most favorite scenes in the Star Wars Saga. However, they are also the most inconsitent scenes in the Star Wars Saga. Between shooting the scenes, re-shooting the scenes (in England), re-re-shooting the scenes (added aliens in California), flipped images, film editing, and such like the Cantina scene is riddled with contradictions and inconsistencies. 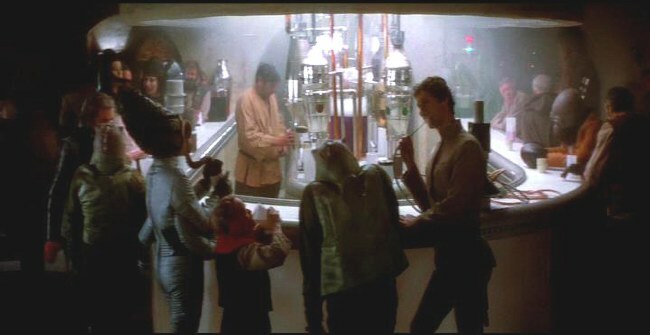 Below are various info and images of the Mos Eisley Cantina. "The cantina sequence made major impact upon a society and truly did something that no film before or after had ever been able to duplicate in terms of creating a rich and full sci-fi environment, it became a staple of cinematic history"
JediTricks as posted on SirStevesguide.